"This is a favorite in our family at Christmas. This jam is not spicy, but can be made to be spicy by adding more peppers or a few habanero peppers. 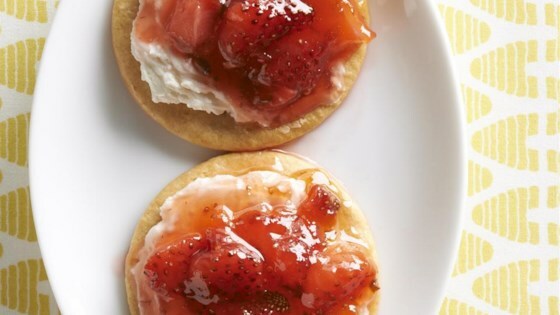 The flavor of the sweet strawberries combined with the flavor of the peppers gives this jam a wonderful flavor dimension. The strawberries may be frozen (thawed and crushed) and the peppers may be canned (drained and chopped)." Place the crushed strawberries, minced jalapeno pepper, lemon juice, and pectin into a large saucepan, and bring to a boil over high heat. Once simmering, stir in the sugar until dissolved, return to a boil, and cook for 1 minute. Sterilize the jars and lids in boiling water for at least 5 minutes. Pack the jam into the hot, sterilized jars, filling the jars to within 1/4 inch of the top. Run a knife or a thin spatula around the insides of the jars after they have been filled to remove any air bubbles. Wipe the rims of the jars with a moist paper towel to remove any food residue. Top with lids, and screw on rings. Place a rack in the bottom of a large stockpot and fill halfway with water. Bring to a boil over high heat, then carefully lower the jars into the pot using a holder. Leave a 2 inch space between the jars. Pour in more boiling water if necessary until the water level is at least 1 inch above the tops of the jars. Bring the water to a full boil, cover the pot, and process for 10 minutes. Remove the jars from the stockpot and place onto a cloth-covered or wood surface, several inches apart. Allow to cool overnight Once cool, press the top of each lid with a finger, ensuring that the seal is tight (lid does not move up or down at all). Store in a cool, dark area. I used a combination of strawberries and raspberries, cut sugar to 6 c and used all the seeds from the jalapeno's and it turned out awesome! Delicious! Serve over a block of cream cheese with wheat thins. Great appetizer.